The Nile River was the highway that joined the country together. Up until the nineteenth century, travel by land was virtually unknown. Ships and boats were the main means of transporting people and goods around the country. 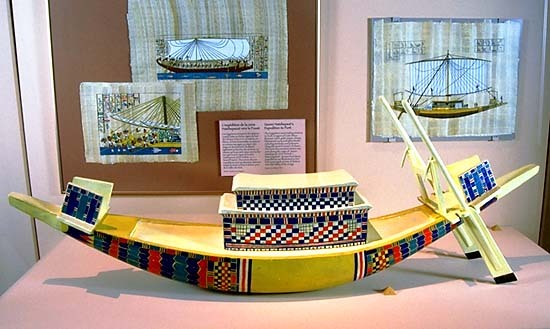 Egyptian watercraft had a high stern and bow, and by the New Kingdom, they were equipped with cabins at both ends. The prevailing winds blew south, propelling boats travelling in that direction, while boats heading north relied on the current and oars. 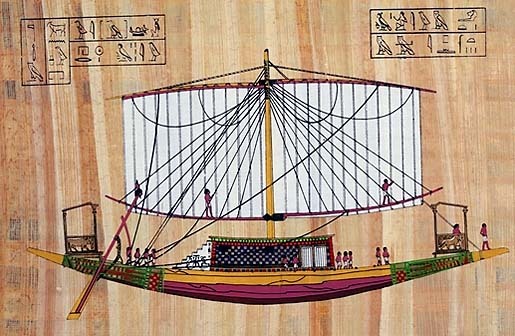 The simplest type of boat used in ancient Egypt was the skiff, made from papyrus reeds that were tied together. Since the reeds are filled with air pockets, they are particularly buoyant. Skiffs were used for fishing and hunting game in the marshes, or for travelling short distances. Large wooden ships were equipped with square sails and oars. Their planks, held together with rope, expanded in the water, making the vessel watertight. 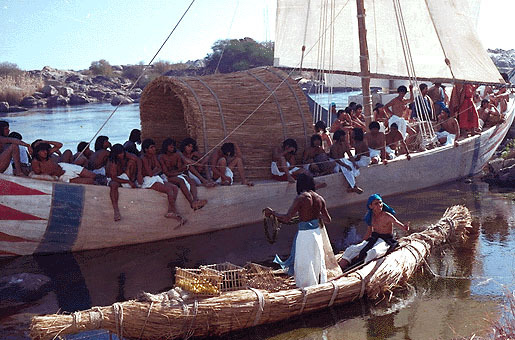 Acacia wood was used in Lower Nubia to build the ships that transported massive blocks of stone from the Aswan district to the building sites of the pyramids, temples and cities along the Nile. 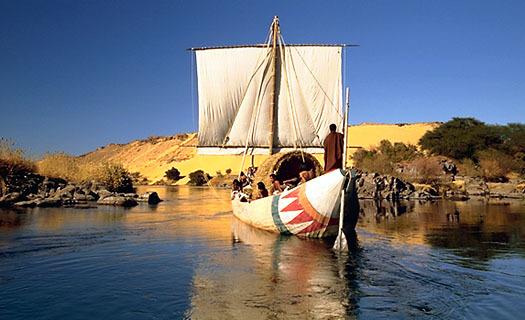 Ships could travel with ease up and down the Nile from the delta region to the First Cataract at Aswan. Boats also served a ceremonial purpose. They were used to move images of gods from temple to temple, and to transport the mummified bodies of royals and nobles across the Nile to their tombs on the west bank. Even the sun god travelled by boat (the solar bark) on his daily journey across the sky. 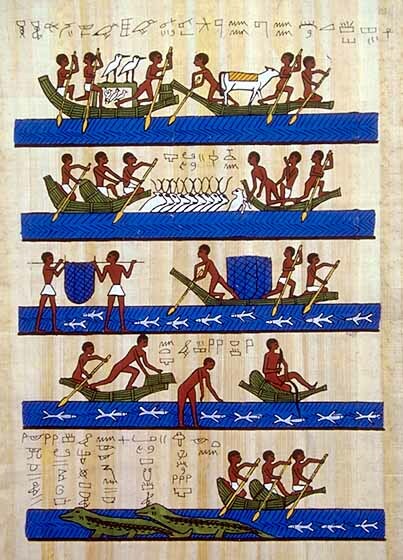 Today, the Egyptians still cross the Nile by boat. 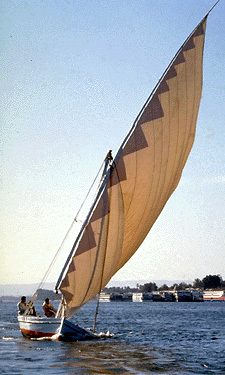 The vessel they use is the fellucca, a small boat with a large triangular sail. The roads in ancient Egypt were little more than paths. To get around on land, people walked, rode donkeys or travelled by wagon. They carried goods on their head, but the donkeys and wagons hauled heavier loads. Camels were almost unknown in Egypt until the end of the pharaonic period. The wheel was probably introduced into Egypt by the Hyksos, an Asiatic people who invaded the country and ruled it in the fifteenth and sixteenth dynasties. 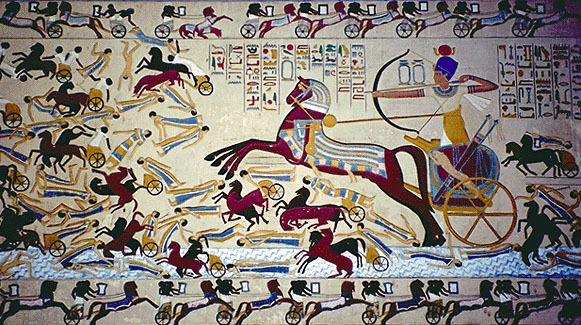 The Hyksos most likely had horse-drawn chariots, which were used in warfare. New Kingdom pharaohs and nobles adopted this mode of transportation for hunting expeditions, but it was not used for travel by the common people.